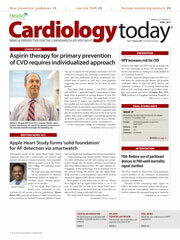 Snapshot summaries of recent study results in cardiology. Comparison of outcomes in patients with HF who were assigned a model of care at hospital discharge with those who did not receive the protocol. Researchers assessed the safety of bempedoic acid in patients with high CV risk and elevated LDL. Assessment of an imaging system (AcQMap, Acutus Medical) during ablation in patients with persistent AF.